“God desires that his people would move outside the walls of their churches. He wants them to meet people wherever they are, whatever they do,” says Del Riemer, Associate Pastor of Summerland (B.C.) Baptist Church. At Summerland Baptist, part of getting outside the church walls means creating a vibrant Music and Creative Arts Outreach. The outreach has four performing bands, each with its own style and audience demographic, who travel throughout B.C, Western Canada and the US to share the gospel of Jesus Christ through music and a message of hope and truth. 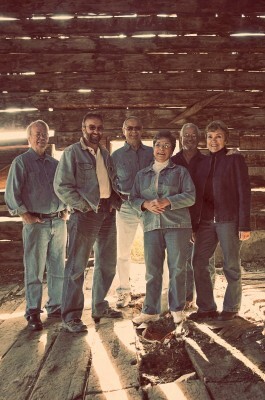 The best known and busiest of these bands is Back Porch Gospel, a bluegrass band whose members are all retired (except for Del). The band visits churches, prisons, treatment centres, parks, seniors’ homes and other venues as far away as Missouri to share the fun and joy of gospel bluegrass music. Most, but not all of the songs are Christian; however, every performance includes stories and testimonies that explicitly witness of Christ and his gospel of hope and forgiveness. “There is something that is down home and fun about bluegrass music. Iit breaks through age and style barriers. Bluegrass provides a phenomenal open door, from prisons to seniors’ homes. It is the style that seems to attract people,” Del says. Hope Road is a contemporary music group made up of people who have come through difficult and discouraging periods of hopelessness in their lives. This team shares a message: that hope lies not in a place or a philosophy, but in the person of Jesus. Members have suffered the death of loved ones, illnesses, sexual abuse, shattered dreams and job losses. “We share that in hopeless situations, hope can come alive again when God breaks through,” Del says. The Groundswell group, made up of six young adults in their 20s and 30s, shares original and inspirational light rock/folk music with jazz and blues overtones to appeal to audiences in their 20s to 40s. “Groundswell is a term surfers use where a deep ocean swell of water rises up creating a larger dynamic wave,” Del says, explaining that this group performs concerts but also does ministry fundraisers, church music and praise as well as music for children. The Three Okanagan Tenors, dressed in tuxedos and accompanied by piano and violin, offer triumphant, familiar songs of faith with a more classical and traditional flavour. The Tenors are well accepted with older audiences in concert and conference settings. The four groups do about 50 concerts a year between them. Since Del plays in three of the groups as well as on church music teams, he enjoys partnering with others in areas of music ministry five to seven times per week. “I am not particular about the style of music. God uses what we offer. I personally have an eclectic musical taste and enjoy wonderful opportunities to use music for God’s glory. We can use any opportunity to connect with people,” he says. “It doesn’t have to be music. I’m really interested in motorcycling, so God uses that too.” He adds that the church’s Roadsalt Riders club attracts those from the local community to connect and enjoy fellowship together. Summerland’s outreach ministry isn’t limited to its four bands. Every second year, the entire community of Summerland anticipates “Uncle Phil’s Dinner,” a dinner theatre that offers a simple gospel message through engaging music and drama. The church also has a bell choir, men’s chorus group and regular music and praise teams. For the past 15-20 years, Summerland Baptist has hosted a monthly Sunday night concert to enrich and share the gospel. Now called Searchlight Gospel, this concert series features local and well-known musicians sharing through many styles, “it’s not to showcase talent but to share Jesus.” Del explains that the concerts attract mostly Christians but offer a way of inviting neighbours and friends who wouldn’t otherwise set foot inside a church. The church also encourages its members to host neighbourhood block parties. A church band performs background music, providing a light, non-intimidating atmosphere. The church helps to organize the event and designs and prints the invitations. The church even has a professional clown who is available to connect with the children. Del himself is a lifelong musician. His dad played steel guitar and his mother the electric bass, and together they led a family music group and had a radio show in the Edmonton area. Del was singing on the show by age two and a half and doing four-part harmony by age four. His mom encouraged him to always be in the same grade in piano as he was in school. By grade eight, he gave up piano but picked up the flute and later became a woodwind specialist. After training in music and theology at Taylor University, Del travelled with a contemporary Christian band called Liberty Union. Throughout the 1970s, Del toured and performed with other well-known Christian musicians. He accepted his first pastoral call at Summerland after an eclectic career as band musician, restaurant manager, worker with young offenders and outdoor wilderness and music director. Summerland Baptist continues to build on its legacy of outreach. The church has assembled a resource trailer containing $50,000 worth of light and sound equipment, allowing the teams to put on a concert anywhere, whether in a church a park or a prison. On the side of the trailer is a picture of a horse-drawn wagon with a pump organ inside, a reference to Summerland’s 1905 origins when, after worship service on Sunday, members would load the pump organ into a wagon and travel 10 miles to the Kettle Valley Railroad camps to lead church services. Del hopes other churches will start neighbourhood block parties so they can connect with their neighbours, discover their interests and come alongside. Bookings for any of the four music outreach teams can be made by contacting Del at pastordel@summerlandbaptist.ca.Originally published in Making Connections, a Canadian Baptists of Western Canada newsletter.